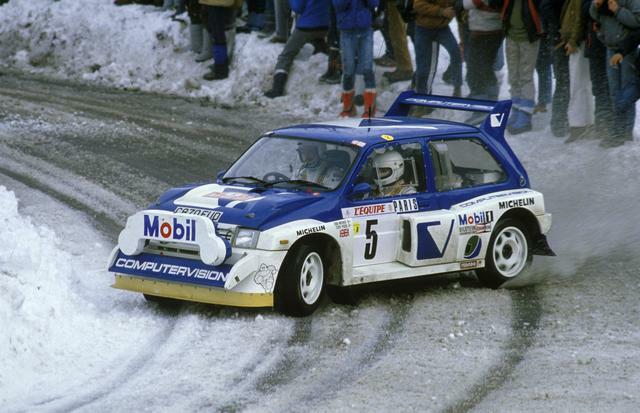 Of all the cars to carry the MG octagon, one of the most dramatic has to be the 6R4 rally car. It was to be the car that would bring back World Championship rally honours back to British Leyland, whose future had been revitalised by the Metro and certainly it had the potential to be supremely competitive. Yet, like the R-type racing car in the 1930s - which would have elevated MG to the technological heights - it remains a tantalising 'if only' car, its career ended before it ever really proved its potential. The background to the 6R4 can be traced back to the glory days of Abingdon-prepared cars in the 1960s - when the Mini Cooper S swept all before it in world rallying with wins from Monte Carlo to the Acropolis and virtually every rally worthy of the name. The little red and white cars, in the hands of drivers of the calibre of Paddy Hopkirk, Timo Makinen and Rauno Aaltonen were household names following their huge success, which undoubtedly increased the sales of showroom Minis and rubbed off on the other cars in, what was then, the British Motor Corporation range. The British Leyland hierarchy were seeking another vehicle to carry the company name to sporting success but in reality there was nothing in the range that fitted the bill. It was only with the announcement of a new Group B category for rally cars, which would essentially allow homologated specials to be built, that would pave the way for the 6R4 programme. It was not to be their own designers that British Leyland turned to however, although the Competitions Department under John Davenport had prepared performance parts for the Metro and a special rallycross version had been produced. This featured a fibreglass body, which surrounded a tubular frame, with power coming from a 1.5 litre A-Series engine which was fitted with a twin overhead camshaft 16 valve head, providing a power output of 200bhp. 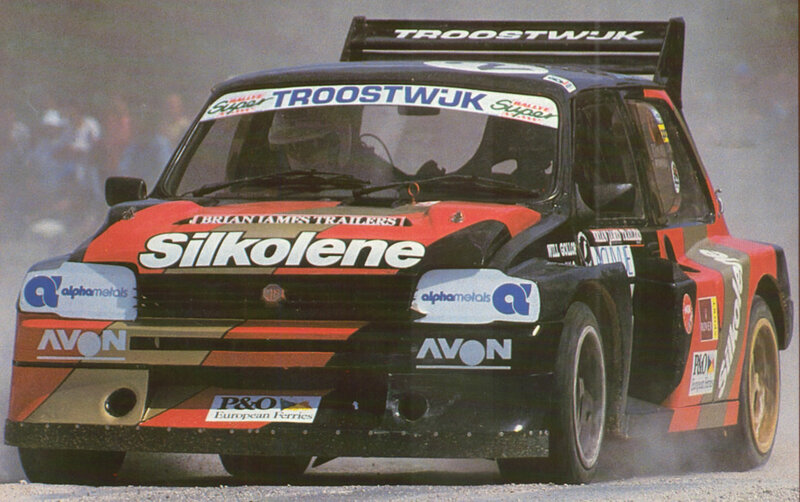 Suspension modifications, wide wheels and tyres all combined to give the Metro a purposeful look, amply confirmed when it started to score victories in rallycross events. At the time, the future of British Leyland Motorsport at Abingdon was extremely uncertain, following the closure of the MG factory. The British Leyland decision was, therefore, to involve Grand Prix racing car manufacturers Williams engineering, in what was to be their first outside project. Their brief was to examine all the British Leyland cars and to recommend a suitable vehicle as a basis for a Group B car. The choice was the Metro and Williams received a standard Metro bodyshell to enable them to start work on the design programme. Very early, the design parameters were set. Following the huge success of the Audi Quattro, the decision was taken to go to permanent 4-wheel drive and a mid-engined layout decided upon. 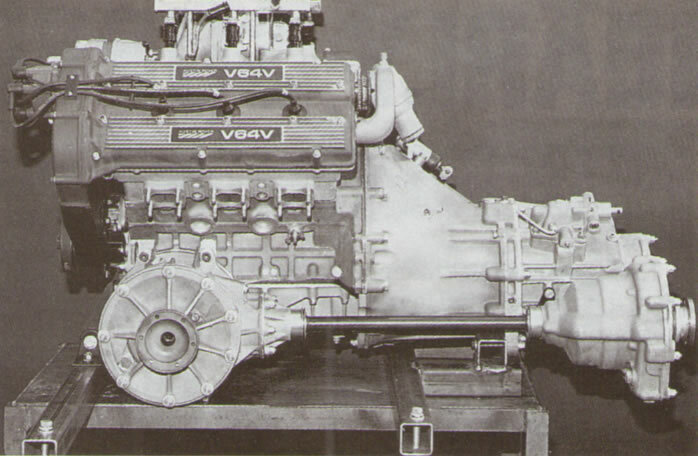 The power unit would be a 250bhp 12-valve V6 engine - developed from the faithful 3.5 litre V8 that had seen service in the Rover and MGB, but cut down in size both dimensionally and in capacity to 2.5 litres. Dry sump lubrication was used and the engine was all alloy. At this early stage, the calculated decision was taken not to follow the turbo charging route as adopted by other manufacturers, notably Audi and Peugeot or indeed that of the Lancia who adopted a dual supercharging and turbocharged installation. The reason for this was because of turbo lag - the performance would be compromised. Hence the choice of a normally aspirated engine not only to give power precisely when it was needed but also to provide improved engine braking. Initially the engine was carburetted, later it would be fuel injected. In February 1984 the project was officially announced. The 6R4 was, like its competitors from Lancia, Peugeot and later Ford, virtually a silhouette rally car. Power for the mid-engine was fed through a five-speed gearbox to permanent 4-wheel drive. Suspension was independent fore and aft by Bilstein struts and Wishbones, while braking was by 4-wheel discs. To say that the MG Metro 6R4 was given a huge welcome from the motoring press would not be stretching a point. Philip Young for example in Sporting Cars captioned his front cover photograph of the prototype cars 'Back on the path to Glory' and the old tartan red and white livery of Abingdon days rekindled the links with BMC. Nor was the car to disappoint. Just one month later, the 6R4 made its competition debut on the York National Rally when, in the hands of Tony Pond and Rob Arthur, the MG demolished the opposition for 55 stage miles - leading an Audi Quattro by almost three minutes before retiring with an alternator fire. It was a debut which promised much. 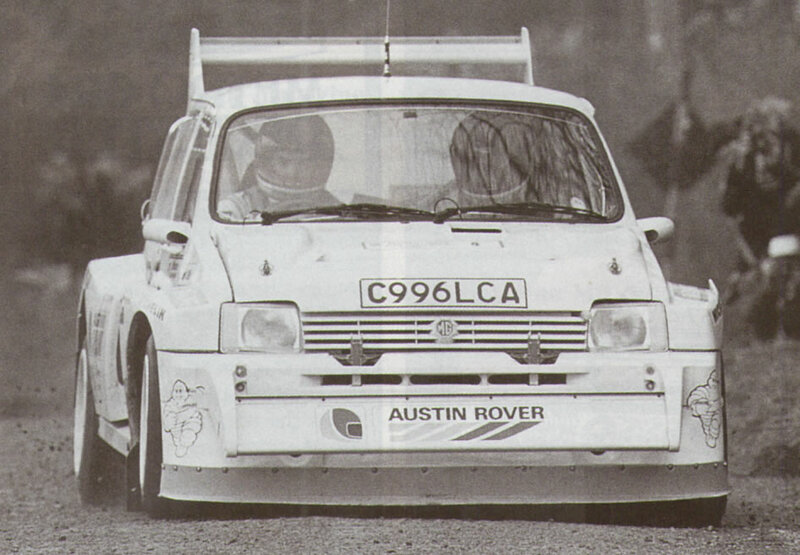 Austin Rover - the British Leyland name having been quietly dropped - had decided on a policy of on-event development and it was to be March 1985 before the 6R4 recorded its first win, again in the hands of Tony Pond and Rob Arthur. This was again a development, or interim, car with increased track and wheelbase and front and rear wings as the final cars. The engine remained the carburetted V6. The event was the Skip Brown Gwynedd Rally and after this success, development work continued for a further two months. By now the cars were all in the familiar blue and white Computervision livery - a consequence of sponsorship having been transferred from the MG Metro Turbos which has been withdrawn from the British Saloon Car Championship. This was a result of the homologation dispute with the RAC over the Rover 3500s competing in this Championship. The announcement of the definitive rally car came in May 1985 - a ominously long time since the decision to go ahead with the 6R4 programme had been made - but still the package looked well developed and highly promising. The two pre-production cars which had been demonstrated to the press at Knebworth House by Tony Pond and Mark Duez now had the new 400bhp V64V engines to the full 3 litre specification including fuel injection. This engine was a completely new design and bore no relation to the previous cut-down V8. Indeed, it was the only engine ever to be designed for rallying, rather than being production based. The bodywork was now fully developed aerodynamically as was the suspension. Further testing followed but the basic car has appeared. The way was now clear for the 200 production cars to be built in order to comply with the FISA regulations to qualify for the Group B homologation. These cars were all built to Clubman specification and were essentially forest rally cars with a detuned engine whose power output was reduced to 250bhp. With an all-synchromesh gearbox this version, known as the Clubman 6R4, was marketed at £40,000 as a ready-to-rally car. FISA representatives made several visits to Austin Rover to validate the production car totals and once the 200 examples were built, the MG Metro 6R4 was homologated as a Group B international rally car. 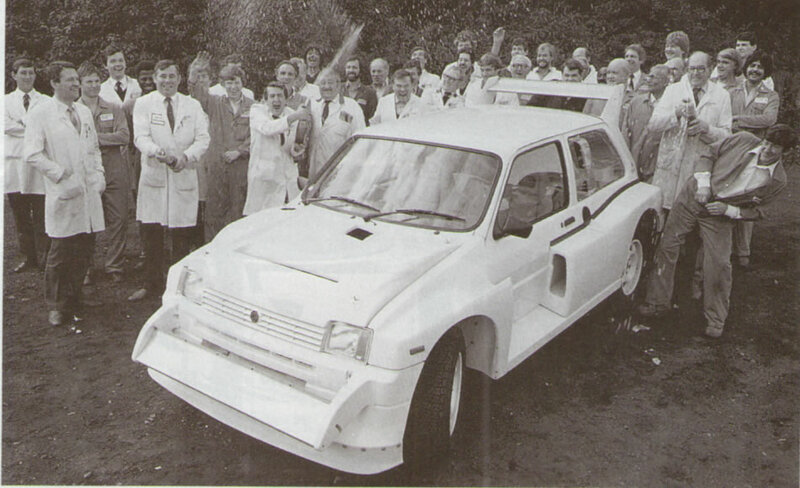 Just how many 6R4s were actually built is difficult to ascertain precisely but what is known is that 233 Clubman bodyshells were manufactured. Of these, 200 were built into Clubman cars which were inspected by FISA, and 20 of these were mock 'Evolution' cars which were meant to be the basis of the Works rally cars. Since these were little more than mocked-up Clubman cars, they were subsequently stripped and sold as shells. Most of the remaining 180 Clubman cars were sole complete to the public, although it is known that some were sold as shells. The remaining 33 Clubman shells were held as spares. There were 12 Works cars in all. These were mostly built from scratch but a few were based on heavily modified Clubman shells. It is significant that Austin Rover built the full complement of vehicles, a fact that was to cost them dearly later. 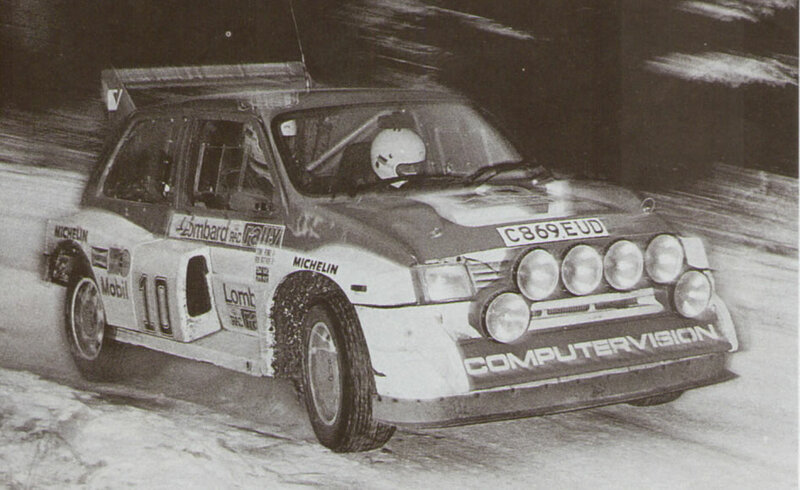 For now though, they had achieved their aim of homologating the car so it could appear in the 1985 Lombard RAC Rally. Much as Austin Rover may have hoped for a good finish on the first international outing for the 6R4 - a top ten would have been commendable, a 3rd overall for Tony Pond and Rob Arthur behind the Lancia Delta S4s of winner Henri Toivonen and Neil Watson and Markku Alen and Illeka Kivimakki was a marvellous achievement. With Peigeot's much fancied entries having retired, the 6R4 had the pleasure of leading home the Audi Quattro of Per Eklund which followed in 4th place. After such a result, Austin Rover viewed 1986 as a learning year in which they would contest a number of World Championship events, gaining experience before mounting a major offensive in 1987. The first outing was to be the Monte Carlo Rally with two cars being crewed by Tony Pond and Rob Arthur and Malcolm Wilson and Nigel Harris. This was not a happy event for Austin, with both cars retiring. Tony Pond found his steering stiffening on the Chartreuse stage and it was subsequently changed. But the replacement rack has been wrongly fitted and he crashed into a road sign. As a result he dropped to 123rd overall and the decision was taken to retire his car because of the potential servicing problems of one lowly placed vehicle and one front runner - Malcolm Wilson meanwhile having climbed to 9th overall. 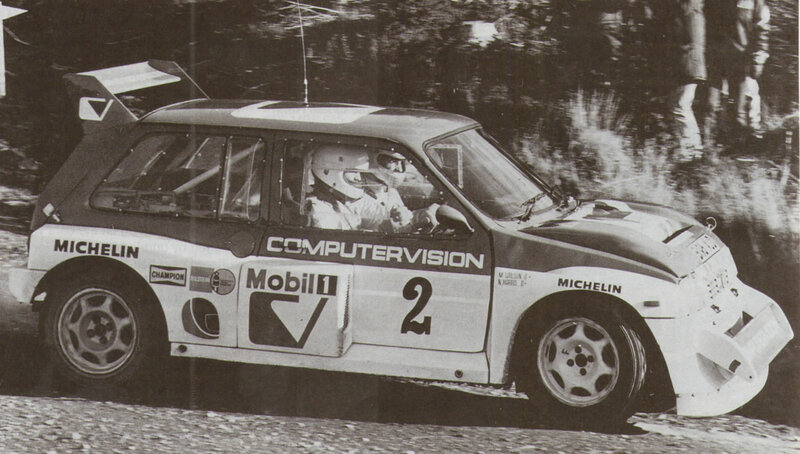 The servicing problem was academic, for Malcolm Wilson'a transmission was to fail. Henri Toivonen's Lancia was to win again. Next outing was the Swedish rally, but following the disappointing Monte Carlo Rally showing, just one Works car for Malcolm Wilson and Nigel Harris was entered, along with the German entered 6R4 of Per Eklund. For the latter, it was to be a short rally for on only the second stage a piston broke up. Malcolm Wilson meanwhile was performing more than creditably until the 14th stage, when a cambelt came off and a valve was damaged. Peugeot were to win with the 205 T16. Hopes were higher for the Portuguese Rally when three Works cars were fielded, Mark Duez and Willy Lux, joining the Tony Pond and Malcolm Wilson cars. All were in the top ten when a Ford RS200 ploughed into spectators standing across the road, a perennial problem with the Portuguese Rally. Three spectators were killed, 30 injured and as a result all the leading teams withdrew. Worse, however, was to follow in the Tour de Corse when the future of all Group B rally cars was effectively ended, following the deaths of Lancia drivers Henri Toivonen and Sergio Cresto when their car left the road and exploded. FISA immediately banned Group B cars from January 1st 1987, the World Championship now being for Group A cars, of which 5000 were required for homologation. Against this background the Metro 6R4s poor performance seems relatively insignificant but again the cars were plagued by unreliability. Tony Pond's car suffered cambelt failure, Malcolm Wilson's an engine failure, while Didier Auriol suffered oil loss, leading to retirement. Despite the forthcoming ban on Group B cars, Austin Rover continued development of the 6R4 and the 1000 Lakes Rally in Finland saw them gaining three top ten places with Per Eklund and Dave Whittock 7th, Harri Toivonen and Cedric Wrede 8th and Malcolm Wilson and Nigel Harris 10th. Overall victory went to Timo Salonen in a Peugeot 205 Turbo 16E T2, with the World Championship being claimed for the marque. San Remo, for long one of the most popular rallies in the calendar, saw the results subject to dispute and subsequently void for the World Championship purposes. 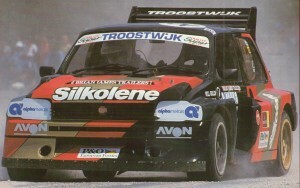 The Works Peugeots were disqualified because of illegal aerodynamics, supposedly giving a ground effect advantage, the result being the Lancia Team annexing the first three places. Of the 6R4s, only Malcolm Wilson was to reach the finish but in an excellent 4th place. All this however was to count to nothing. 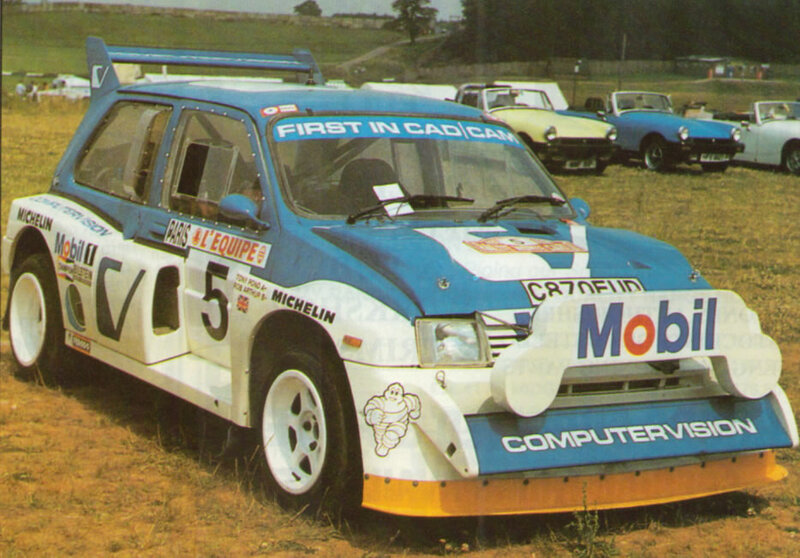 The 6R4 international swansong was to be the RAC Rally and the Group B cars dominated the results. Peugeot avenged their disqualification in San Remo by taking victory through Timo Salonen but the 6R4s were well on the pace throughout, finally taking the Team Prize through 6th with Tony Pond, 7th with Per Eklund, 8th with Kimmy McRae and 9th with David Llewellyn. 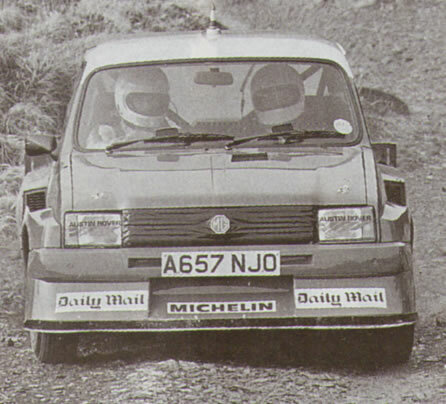 This then, was the international history of the MG Metro 6R4, but it had been very successful in 1986 on National rallies in the hands of such drivers as David Llewellyn, who took the Circuit of Ireland and Tony Pond who won the Manx. The Skip Brown, Granite City, Mewla Stages, Lindisfarne and Quip Firest Stages all fell to the 6R4s and the Marlboro Autosport RAC National champion was Alistair Sutherland in a 6R4. On the Irish Tarmac Stages the 6R4 was also to show well. 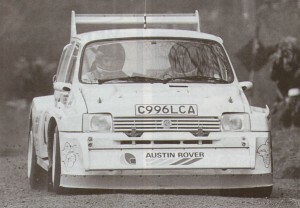 Following the Group B ban, the RAC sanctioned the running of the Clubman version of the 6R4 in National events and this enabled Austin Rover to sell the Clubman 300 spec (ironically more powerful than the original Clubman) at £16,500 ready-to-rally. It is recorded that cars were purchased for much less than this figure - some as low as £8000. At National and Club level therefore, the 6R4 has been welcomed, particularly by drivers keen to move up to more powerful machinery. As such, it has been well nigh invincible at these levels of competition and, despite a subsequent drop in capacity to 2.5 litres for 1992 - being insisted upon by the RAC - and a handicapping of seven seconds a mile on certain events, the MG remains a potentially rally winning car. Although Austin Rover did manage to dispose of its Clubman cars, the fate of the Group B Works cars and 'Evolution' models was uncertain. All the leading Group B marques, including the MG, subsequently graduated to rallycross where the Metro has, with constant modification, proved highly competitive.